Here is a series of watercolor miniatures I did for Christmas framable ornaments this past Christmas. 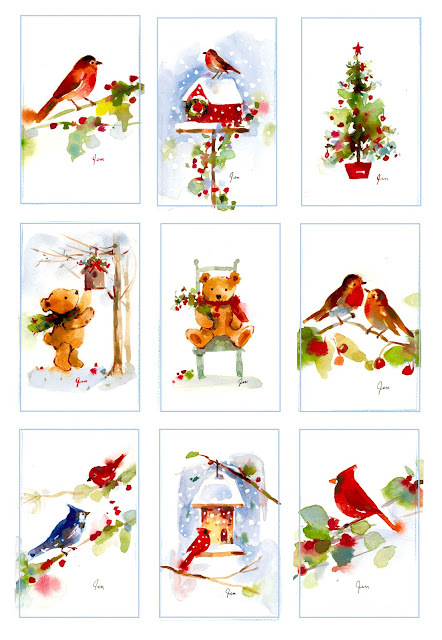 Each watercolor was 2"x 3". I love to paint Christmas anytime of the year. It is my favorite holiday. Bears and birds are some of my favorite subjects to paint. these are pretty!!!! love the color...Merry Christmas. This is beautiful! You are very talented. I am am an illustrator and have worked in the social expression industry for 17 years. 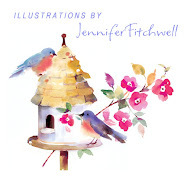 I have also illustrated children's books, and my watercolors have been featured on ceramic ware and home decor items as well as for print as greeting cards.